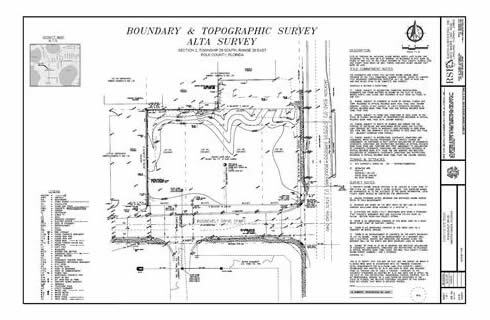 ALTA/ACSM Survey is a boundary survey that meets the highest standards jointly proposed by the American Land Title Association and the American Congress on Surveying and Mapping. This survey incorporates elements of the boundary survey, mortgage survey, and topographic survey. ALTA/ACSM surveys, frequently shortened to ALTA surveys, are often required for real estate transactions. It is recognized that members of the American Land Title Association (ALTA) have specific needs, pertinant to title insurance matters, which require particular information for acceptance by title insurance companies. In the general interest of the public, the surveying profession, title insurers and abstracters, ALTA, the American Congress on Surveying and Mapping (ACSM) and the National Society of Professional Surveyors, Inc. (NSPS) jointly set forth such details and criteria for standards. Rapid Surveying can provide our clients with an ALTA Survey that will meet all requirements of the ALTA guidelines. We suggest you, your engineer, or financial agent prepares the optional services from Table A, “Optional Survey Responsibilities and Specifications” as stated in the Minimum Standard Detail Requirements for ALTA/ACSM Land Title Surveys. This table consists of many different requirements and each will increase the project's cost and time of completion. Please look at website link for ALTA/ACSM on our <links> page.